Regency Franchise Group is thrilled to announce another addition of Regency of the Triad to the Regency franchise network. This partnership comes from the merging of American Refreshment and Supplies in Winston-Salem, North Carolina with Regency Franchise Group. American Refreshments and Supplies began in 2002 as a single source solution offering office supplies, coffee service and refreshment vending services. Now as Regency of the Triad, they offer a new online supplies and printed materials ordering and management program. They will provide their customers with a program that will also include printed products, promotional and apparel items through customized company stores. The Regency Franchise Group was born from the success of Regency Business Solutions — one of the fastest-growing print, promotional products, corporate apparel and office supply companies in the nation that was not built through acquisition. Founded in 2002 by veterans of the B2B services world, the founders of Regency looked to change the way office products are brought to market. By combining a unique buying experience with the ability to serve multi-location customers, Regency has redefined what is possible for the Independent dealer, as well as changed the game in their favor. 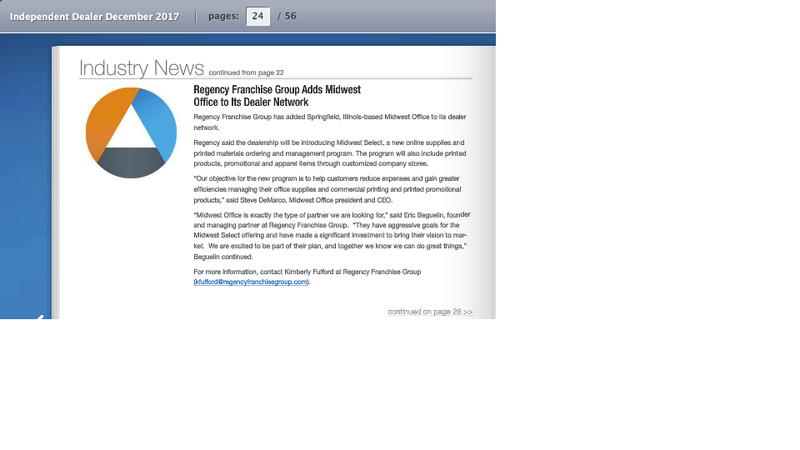 Regency’s newest addition, Midwest, has been spotlighted in December’s Independent Dealer. Please follow this link to read the article! Regency Franchise Group is excited to announce Midwest Office, the fastest growing independently-owned office products dealer in the Midwest, has joined the Regency network. Through this alliance, Midwest Office is proud to introduce Midwest Select, a new online supplies and printed materials ordering and management program. Midwest Select gives its customers access to a purchasing coalition that will dramatically reduce prices through bulk ordering. The program will also include printed products, promotional and apparel items through customized company stores. “Midwest Office is exactly the type of partner we are looking for,” said Eric Beguelin, Founder and Managing Partner at Regency Franchise Group. “They have aggressive goals for the Midwest Select offering and have made a significant investment to bring their vision to market. We are excited to be part of their plan, and together we know we can do great things,” Beguelin continued. Founded in 2000, Midwest Office has become the fastest growing independently-owned office products, equipment, commercial printing and promotional products companies in the Midwest. Headquartered in Springfield, Illinois, Midwest Office has eight sales offices and furniture showrooms serving businesses in Illinois, Missouri and Kansas. In 2000, Midwest Office became a CBSC Preferred Partner and in 2012 was named CBAI Vendor of the Year. Regency was able to close that gap. Hoyle Office Solutions is a franchisee of Regency Franchise Group, a company founded in 2002 based out of Raleigh, North Carolina that is one of the fastest growing print, promotional products, corporate apparel and office supply companies in the nation. RFG extends its innovative technology to its franchisees which enables them to consolidate transactions into a single shopping cart, provide customized account payable solutions, custom client stores, and participate in national buying power. Jonathan Durham started with Regency in 2006 and was prospecting for potential franchisees when he found Office Mart in 2014. Office Mart was established in 1977 in Lancaster, Ohio by Pat and Susie Blake and prides itself in serving its local community at competitive prices. When Durham found that it was for sale, he jumped at the chance to buy it with his partner, Jason Fisher. Of the purchase, Durham said, “I thought, this is an opportunity, a chance to open additional doors and since I grew up in the ‘Regency world’, I thought I could help.” With the sale complete, they went in and, to date, have retained 81 percent of the staff and have found that with the tools that Regency offers, the business has grown a great deal. Office Mart saw a 12.5 percent revenue growth from the first quarter of 2015 to the first quarter of 2016. As he worked with Office Mart, Durham found that “the Regency platform could really help this company do even better” when it came to the technology that was available. With Regency, Office Mart was able to grow into a faster, stronger and better business because of the advantages offered through Regency’s expertise. The technology opened up the ability for the Office Mart sales representatives to go after other areas of revenue as it pertained to their pre-established customer base. It also allowed online customers a better shopping experience thanks to the single shopping cart Regency offers. In just 60 days, Office Mart’s entire customer base had converted to the new platform. Office Mart is a franchisee of Regency Franchise Group, a company founded in 2002 based out of Raleigh, North Carolina that is one of the fastest growing print, promotional products, corporate apparel and office supply companies in the nation. RFG extends its innovative technology to its franchisees which enables them to consolidate transactions into a single shopping cart, provide customized account payable solutions, custom client stores, and participate in national buying power. 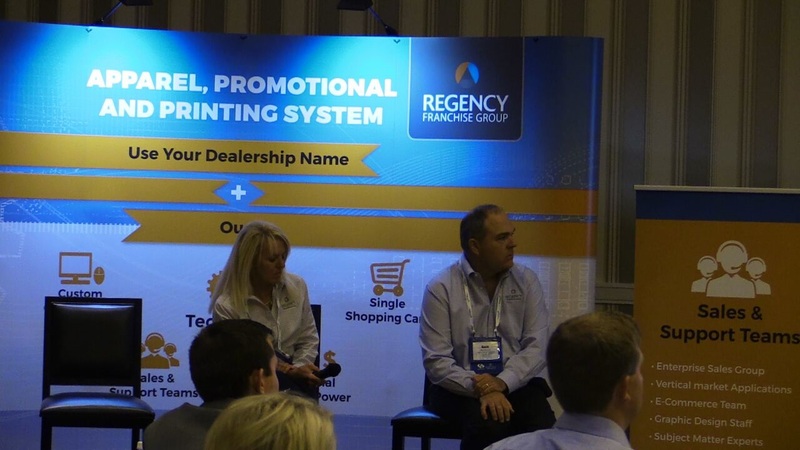 Regency Franchise Group spent July 20-23 in Washington, D.C. for its national sales conference. With a spin off theme of “Regency Revolution”, this year was all about growth. As part of the conference, there were three presentations done by members of the Regency team which shared the best methods and ways to improve in business. The presentations were a competition, dubbed the Value2 Cup, and the Regency team members in the audience were the judges. The winner ended up being Capital Ford Automotive of Regency franchise, TNT, which was presented by Kimberly Fulford (not pictured) with assistance from Linda Hanson (left) and David Sturdivant (right). Sturdivant and Connie Lancaster are both with TNT, a business which prides itself in “branding with a boom by developing unique and business-aligned concepts with the aim of helping clients create long-lasting relationships through the power of stand-out promotional products.” Regency helped Capital Ford by supplying state of the art technology to them, which cut down on time and expenses especially as it pertained to apparel. The conference ended with an announcement of next year’s location, which will be in Orlando, Florida. 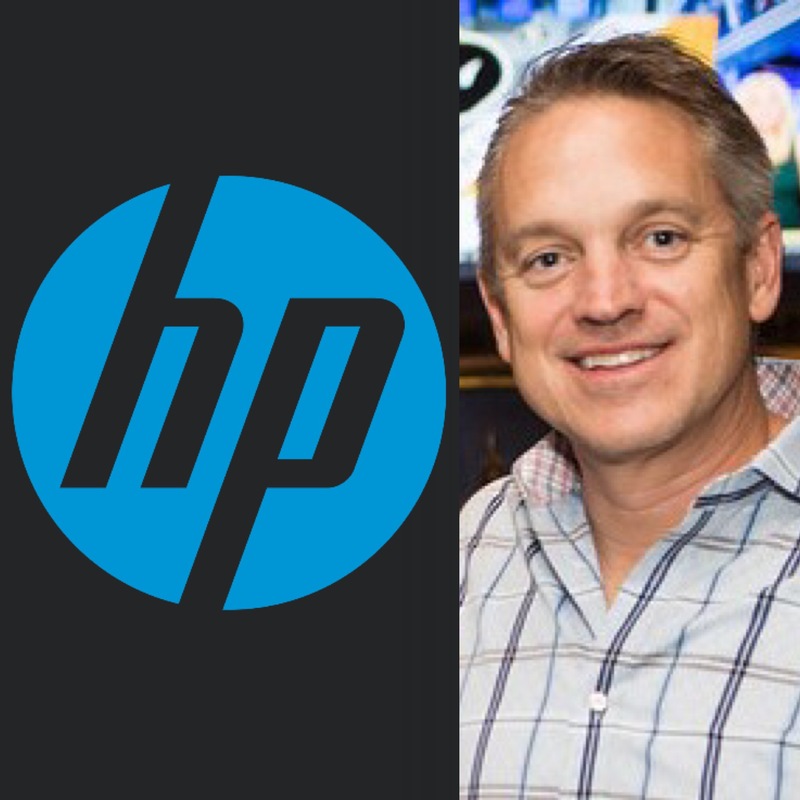 We are thrilled to say that Regency has been recognized as one of the Top 10 Best In Class HP MPS channel partners for the second half of the 2015 HP fiscal year. When Roscoe Properties joined forces with Gonzalez Office Products, no one could have known the partnership that would one day result in a booming business venture. With an e-print store that contains products from business cards to apparel to badges, there are endless possibilities for what can be put into the customized online store. Roscoe Properties, a property management company in Texas, manages over 50 properties and adds one to four a month. They are a fast-growing, high energy business with plans to expand outside of Texas within the next year. Gonzalez Office Products aids them by being a single source provider for everything they need from print, promo, furniture and break room supplies. Gonzalez has enabled Roscoe Properties by utilizing high end technology to mainstream products they buy which saves time, money and effort. In working with RFG Growth Teams, Gonzalez is able to provide specific solutions for Roscoe’s needs by utilizing the signature technology from RFG. Since their corporate e-store went live in June of 2015, they have seen a 120 percent increase in monthly purchases. If you compare the month before the e-store opened to just one year later, there has been an increase in sales by 158 percent. Roscoe began with only a few locations before growing to the titan that it is now which needs a signature launch page solution. From strategy calls to subject matter expert involvement as well as attending client-facing appointments, RFG supported Gonzalez from beginning to end. That process is utilized today for new hires and locations and procurement of items from floor mats to marketing materials to pens. This partnership has even led to additional accounts for Gonzalez Office Products because of employees spreading the word of how beneficial the relationship is on both ends. At the end of the day, the collaboration between Roscoe Properties and Gonzalez Office Products has been invaluable and will only continue to grow as time passes. Gonzalez Office Products is a franchisee of Regency Franchise Group, a company founded in 2002 based out of Raleigh, North Carolina that is one of the fastest growing print, promotional products, corporate apparel and office supply companies in the nation. RFG extends its innovative technology to its franchisees which enables them to consolidate transactions into a single shopping cart, as well as provide customized account payable solutions. The Industry Achievement Award was given out in Washington, D.C. on Saturday, July 23rd to an individual in the office products industry who is considered to have made exceptional contributions over the span of their career. This year, that person was Kathy Hoyle. In May of this year, Hoyle partnered with Regency Franchise Group, a company founded in 2002 based out of Raleigh, North Carolina that is one of the fastest growing print, promotional products, corporate apparel and office supply companies in the nation. RFG extends its innovative technology to its franchisees which enables them to consolidate transactions into a single shopping cart, as well as provide customized account payable solutions. Hoyle attributes RFG with making her “more excited about [her] business than [she’s] been in a long time.” She thanked and recognized them during her speech. To find out more, please see the following link: http://www.opi.net/news/outstanding-dealers-recognised-at-abc/#.V5Y7kUxwyWo.email. When TNT, a franchisee of Regency Franchise Group, reached out to Capital Ford Automotive four years ago, Capital was struggling to manage the high volume of shirts that were needed for their employees. From the ordering process to the labeling to ensure the shirt would eventually go to the right employee, to the end delivery, there was no process, which led to a waste of time and manpower. That’s when Regency came in to help. Regency supplied state of the art technology to Capital, which cut down on time and expenses. This technology gave Capital an e-store that provided their employees access to employee kits, name badges, apparel, print and promo items. So, when Capital decided they wanted all of their employees out on the lot in the same shirts, the e-store was there with the Regency technology to make the process seamless. By implementing the use of employee coupons in order to remove the middleman of payroll deduction, 97 percent of employees ordered their shirts in the allotted two week period. These shirts were then ordered in bulk, processed and organized through Regency in an efficient progression. TNT is a franchisee of Regency Franchise Group, a company founded in 2002 based out of Raleigh, North Carolina that is one of the fastest growing print, promotional products, corporate apparel and office supply companies in the nation. RFG extends its innovative technology to its franchisees which enables them to consolidate transactions into a single shopping cart, provide customized account payable solutions, custom client stores, and participate in national buying power. North American business products wholesaler SP Richards (SPR) has confirmed it will not be able to hold a traditional Advantage Business Conference (ABC) event in 2020. Office products, first aid and cutting tools vendor Acme United grew Q1 operating profit by more than 12% as cost-saving actions implemented in 2018 began to kick in. Plus stories on EFI, Staples Retail, Bunzl, Salone del Mobile and Honeywell. First quarter sales at wholesaler SP Richards (SPR) increased by 1%, parent company Genuine Parts (GPC) has revealed in its quarterly earnings release. SP Richards (SPR) recently recognised its top suppliers and raised $400,000 for City of Hope at its annual Supplier Summit. © Regency Franchise Group. All rights reserved.